Our newest quarterly report on the catastrophe bond and insurance-linked securities (ILS) market has now been published. The report, ‘Q2 2016 Catastrophe Bond & ILS Market Report – A quiet quarter fails to keep up with investor demand‘, analyses a second-quarter with $1.624 billion of issuance. This report reviews the catastrophe bond and insurance or reinsurance-linked securities (ILS) market issuance at the end of Q2 2016, analysing the risk capital issued during the second-quarter and the composition of transactions completed. Data from the Artemis Deal Directory shows that over the last decade catastrophe bond and ILS issuance in the second-quarter averages more than $2.6 billion, the only quarter in this period to average north of $2 billion. Q2 2016 issuance failed to hit $2 billion, however, with just $1.624 billion of new risk capital issued from 14 transactions, so unlikely to have met investor demand. This is the first time since 2011 that issuance has failed to reach $2 billion, resulting in a decline in the outstanding market size from the record-breaking $26.516 billion seen at the end of Q1, to $25.174 billion. A quiet second-quarter of 2016, in terms of deal volume, saw the outstanding catastrophe bond and ILS market size decline from the end of Q1. Despite this, a host of private deals, a decent level of diversification and continued investor appetite meant the outstanding market remained above the $25 billion threshold first breached at the end of 2014, according to the Artemis Deal Directory. 14 deals comprised of 23 tranches of notes came to market, resulting in $1.624 billion of new catastrophe bond risk capital issued. Two new sponsors entered the space in Q2 2016, but as seen in many recent quarters it was repeat sponsors who dominated Q2 providing 74%, or $1.199 billion of the total new risk capital issued. 50% of Q2 issuance came from transactions that could be considered private which amounted to roughly $304 million of the issuance, after a notable lack of private cat bond issuance in the first-quarter. Indemnity protection dominated issuance in Q2 2016, with sponsors securing more than $1.1 billion of indemnity structured cover, accounting for 73% of the total risk capital issued in the quarter. The remaining 27%, or $399 million of issuance in Q2 utilised an industry loss index trigger structure. Continuing the trend seen in the first-quarter of 2016 no single peril significantly dominated catastrophe bond and ILS issuance in Q2, so the quarter offered investors a variety of perils. U.S. multi-peril claimed the largest slice of issuance in Q2 at $535 million, or 33% of total risk capital issued. So, catastrophe bond and ILS issuance in the second-quarter of 2016 failed to break any records and the outstanding market shrank as a result. However the amount of cat bond risk capital outstanding grew year-on-year, up $627 million to $25.174 billion, compared to the end of Q2 2015. With third-quarters typically quiet and over $800 million of cat bonds set to mature, the market could shrink again slightly at the end of that period. So all eyes will be on the fourth-quarter pipeline, typically a busier period, to see if the outstanding catastrophe bond market can grow once again at year-end. Also in this Q2 2016 report we feature cat bond market commentary from co-editor GC Securities, the investment banking, capital markets and ILS specialist arm of reinsurance broker Guy Carpenter. Download the full report to read GC Securities commentary on recent catastrophe bond market issuance and trends. 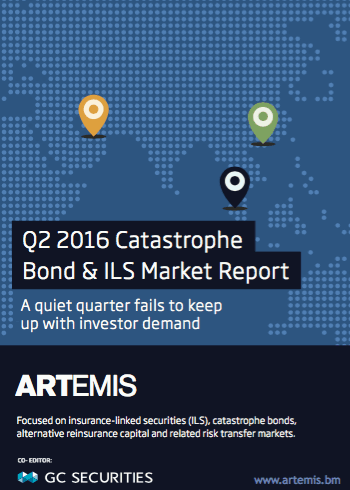 For full details of the quarter, including a breakdown of the issuance by factors such as perils, triggers, expected loss, pricing, and analysis of the issuance trends by month and year, download your copy of Artemis’ Q2 2016 Cat Bond & ILS Market Report here.